Purpose: A subtle lightening system that gradually illuminates and nourishes your natural tones with each wash. Ingredients: Shampoo; Water, Sodium Laureth Sulfate, Sodium Lauryl Sulfate, Benzylalcohol, Glycol Distearate, Cocamidopropyl Betaine, Cetylalcohol, Betaine, Fragrance, Caramel, Cocamide Mea, Lactic Acid,Sodium Chloride, Yellow 10, Guar Hydroxypropyltrimoniumchloride, Disodium Edta, Malic Acid, Iron Oxides/Ci 77491, Mica,Glycine, Ethylhexyl Methoxycinnamate, Benzophenone-4, Propyleneglycol, Yellow 5, Ext. Violet 2, Sodium Hydroxide, Ppg-9,Methylchloroisothiazolinone, Peg-12 Dimethicone,Methylisothiazolinone, Honey Extract, Calendula Officinalisflower Extract, Salvia Officinalis (Sage) Leaf Extract, Camelliasinensis Leaf Extract. Conditioner; Water, Cetearyl Alcohol, Behenamidopropyl Dimethylamine, Cetyl Esters, Fragrance, Stearyl Alcohol, Lactic Acid, Dipropylene Glycol, Silicone Quaternium-22, Mica, Ppg-3 Myristyl Ether, Caramel, Disodium Edta, Titanium Dioxide, Glycine, Malic Acid, Glycerin, Propylene Glycol, Yellow 5, Tin Oxide, Methylchloroisothiazolinone, Methylisothiazolinone, Honey Extract, Calendula Officinalis Flower Extract, Salvia Officinalis (Sage) Leaf Extract, Camellia Sinensis Leaf Extract. In-Shower Lightening Treatment; Aqua, Decyl Glucoside, Hydrogen Peroxide, Ammonium Bicarbonate, Propylene Glycol, Sodium Laureth Sulfate, Cetearyl Alcohol, Ammonium Hydroxide, Ethanolamine, Ceteareth-30, Dimethicone, Parfum, Acrylates/Beheneth-25 Methacrylate Copolymer, Polyquaternium-7, Panthenol, Myristyl Alcohol, Phosphoric Acid, Tetrasodium Edta, Disodium Phosphate, Salicylic Acid, Mel Extract, Calendula Officinalis Flower Extract, Salvia Officinalis Leaf Extract, Camellia Sinensis Leaf Extract, Butylphenyl Methylpropional, Limonene. My natural hair color is dark brown and I've been wearing it the same for the past decade. Boring, right? I thought so too. So when I saw that John Frieda came out with a hair lightening collection, I jumped at the opportunity to try it out. I've read a lot of mixed reviews on the collection, with some customers complaining that it did absolutely nothing to lighten their hair and there were those who loved the lightening system all together and continued to use it. I'm going to be honest here, if you're looking for a noticeable difference, you won't get the same color payoff as you would with regular hair dying products. This collection simply claims to give your hair a slight lift in tone while cleansing and nourishing your tresses in the shower. There aren't many collections like this out there, first and foremost. 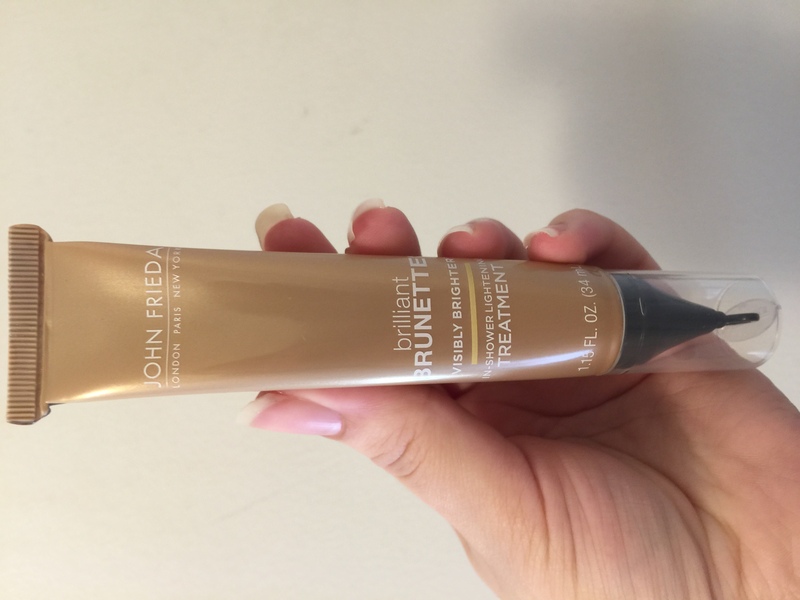 John Frieda is a respectable and well-known brand which is why I decided to let go of my reserves to try this system out in the first place. With that being said, let's move on to my experience with the collection and my recommendations! I was growing tired of my dull brown hair before I decided to try these new products from John Frieda. Although the collection came out a few years ago, I still find that the formula works well with my type of hair and no damage was done to it that wasn't already there. Not that these products might damage your hair, but you should always be careful about your hair care routine and what you're putting into your locks. The mixture in the tubes are peroxide free and are infused with honey and marigold extracts, giving your hair a very potent but manageable smell. The shampoo and conditioner both give easy slips while combing or finger-combing through your hair and the in-shower lightening treatment is super safe to use even without gloves on. I made sure to read the instructions carefully, broke off the tab at the tip, and used the In-Shower Lightening Treatment first on wet hair. I massaged the product and concentrated it on the roots, then distributed it evenly throughout my hair and rinsed it off after leaving it in for 5 minutes. Followed the shampoo with the conditioner, and mainly applied it to the middle section of my hair and the ends, and used it to comb through my hair and to get rid of the tangles, then continued to rinse it off. I began to see my natural tones highlighted by the second wash. The more you use the shampoo and conditioner, the more of a difference you'll see in the long run until you run out of product. However, if you want to maintain the brightening portion and you still have more shampoo and conditioner left, you can repurchase the In-Shower Lightening Treatment again. All three products can be purchased separately from different stores, which is what I did and it ended up being cheaper than the first time I tried these products. Now while the lightening part isn't permanent, it's a great option for temporary use and it won't scare you into trying other hair coloring options in the future. I recommend this collection if you're unsure if you want to go and try out semi-permanent or permanent hair colors. Also, always do your homework before testing out any hair dying products guys! Make sure your scalp is in decent condition before applying any type of hair lightening product. And by decent condition, I mean make sure your have no open scabs, or cuts or anything that would cause your scalp to burn. I hope you guys will take a walk on the John Frieda side and try this hair lightening system out for yourselves! If you want to see more updates, please check out my Instagram and Twitter handles: @fleekonabudget. Read next: Oh, You Mad Cause I’m Melanin Rich? What's the Deal With the Kylie Cosmetics Brush Set?